Gutters might not be the most exciting addition you make to your home this year, but whether installing new gutters is high up on your list of best home improvement projects or not, choosing the right gutter system is still important. Gutters serve to protect your yard from becoming drenched by unfiltered rainfall, and they keep you from having to walk through a dripping curtain every time you pass under your roof in the rain, but when you choose the wrong gutters for your home, you could find yourself regretting your choice immediately. That’s why Minnesota Leafless Gutters wants to help you choose the right gutter system for your home and offer you our Minneapolis, MN gutter installation services! At Minnesota Leafless Gutters, we offer two gutter styles for you to choose from. Our more popular gutter style is k-style gutters, which are more square-cut and are often used for contemporary houses. K-style gutter systems have the advantage of being cheaper than half-round gutters and being exceptionally sturdy gutters. However, k-style gutters do not drain water as smoothly as half-round gutters because of the sharp corners of this gutter style, so if you have trees that drop leaves on your roof consistently, or your gutters generally have trouble with water flow, k-style gutters may not be your best option. Our more traditional gutters are half-round gutter systems, which make for very effective water draining gutter systems because of their curved shape, free of any sharp corners. However, half-round gutters are a more expensive gutter system, and they can be less durable gutters than k-style gutters, especially depending on the material used. Aluminum gutters are our most affordable gutter system available, and aluminum makes for a durable gutter material, though less so than other materials available. Aluminum gutters are preferable to weaker gutter systems, such as vinyl gutters, which we do not install because we know that they’re too weak to last through strong Minnesota storms and harsh weathering. That said, aluminum gutters require some maintenance if they’re going to last as long as they can, which is about 15 years. Galvanized and stainless steel gutters, though a slightly more expensive option than aluminum gutters, are a more durable, low-maintenance gutter system, require very little care. Galvanized steel gutters can last for about 15 years, like aluminum gutters, but they require less protection against weathering because they’re more protected from corrosion. Stainless steel gutters can last even longer with less maintenance than even galvanized steel, protected against rusting and corrosion as much as possible for an added cost. 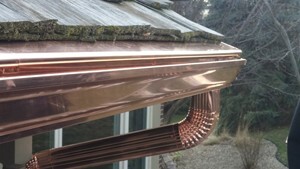 Our final gutter material available is copper, and copper gutters, though our most expensive gutter system, are the most durable gutter system available. Copper gutters can last upwards of 50 years, giving you the best value for your money and giving your home a distinctly unique look. For more information about the gutter system types or Minnesota Leafless Gutters’ Minneapolis, Minnesota gutter installation services, contact us today at (612) 221-0362 or mnleaflessgutter@gmail.com.